I like to travel--just about anywhere. California for sure and to revisit New Zealand where I was born. I specially love to travel by train. But my sensory and movement differences get in the way. 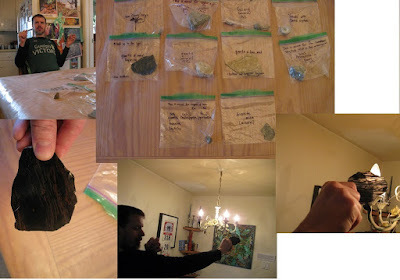 My friends who do travel bring back rock samples as well as photographs and postcards. I have a special rock cabinet with the rocks labelled with their composition and the place they were picked up. I have rocks from all over Canada from the Avalon Peninsula in Newfoundland to Yellowknife. From outside Canada too, in various parts of the US and the Caribbean, Iceland, Ireland, Spain, Italy, Russia, Korea and New Zealand. I have just been given a collection of special rocks from northern Ontario by a geologist Lindsay Debono. Stuart is helping me to post photographs of them.